Russia expands blitz, Ukraine drawn in. As expected Russian forces opened up a new front line in the province of Abkhazia invading the internationally recognized sovereign territory of Georgia. The Georgian Government has stated that 4,000 Russian soldiers have been sent to this region. This is on top of the troops pushing forward in South Ossetia. The province of Abkhazia has been a de-facto republic and autonomous region of Georgia living quite peacefully until recently. 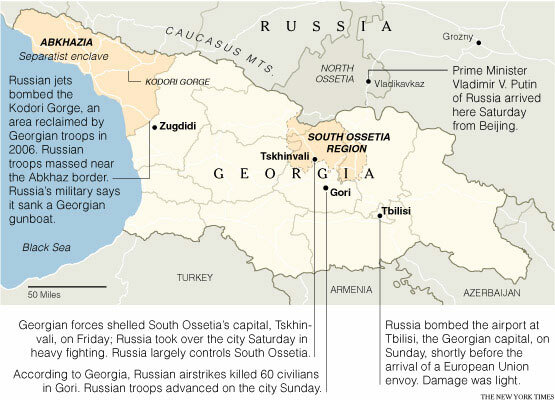 The assault from Abkhazia has been backed by both separatists in the region and the Russian Navy. Here is where Ukraine gets involved.